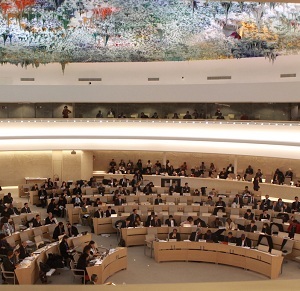 The UN Human Rights Council’s panel discussion on ending discrimination and violence against people on the grounds of sexual orientation or gender identity has been welcomed despite a walkout by some Islamic states. The discussion was opened yesterday by UN’s Secretary General Ban-ki Moon who said attacks against gay and trans people were a “stain on our collective conscience”. While the Council’s first panel on discrimination against gay and trans people was heralded as a “milestone”, it was also opposed by the 57-country Organisation of Islamic Cooperation who said it had “nothing to do with fundamental human rights”. Members of the OIC walked out before the 47-member Council began its discussion. The UN’s Human Rights Commissioner, Navi Pillay, said that while some states may say there is a “conflict with local cultural or traditional values, or with religious teachings, or run counter to public opinion”, the “balance between tradition and culture, on the one hand, and universal human rights on the other, must be struck in favour of rights”. Roy Brown, in a statement to the Council on behalf of the International Humanist and Ethical Union said: “These states are either unaware of the genetic and biological basis for differences in sexual orientation or are prepared to ignore such evidence for religious reasons. No doubt they also wish to shield their own appalling human rights records from too much scrutiny. “The opposition to the discussion expressed by the OIC is a timely reminder that, for them, the Universal Declaration on Human Rights and the International Covenant on Civil and Political Rights do not apply universally. Libya’s representative reportedly told the Council last month that gay issues “affect religion and the continuation and reproduction of the human race”. Despite opposition, the panel discussion affirmed the Council’s commitment to fighting human rights infringements against LGBT people globally. Ms Pillay called on countries to decriminalise homosexuality, abolish the death penalty for offences involving consensual sexual relations, harmonize ages of consent for heterosexual and homosexual conduct, and introduce anti-discrimination laws. She also called on countries to recognise that persecution on the grounds of sexual orientation could be a valid reason to seek asylum. Lance Price, Director of the Kaleidoscope Trust, said: “This is a milestone development. The UN Commissioner for Human Rights has made it clear that there can be no ifs and no buts. The rights of LGBT people are not special rights. They are the same basic human rights to which everybody is entitled. The debate starts here. “The powerful recommendations set out today set a clear agenda for action and mark a major step forward in a global campaign for justice that gathers momentum every day. “There are huge challenges to be faced and we call on the Commonwealth to show the same level of commitment.